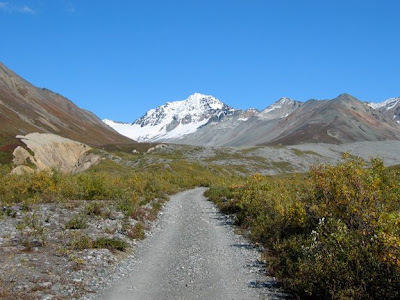 Two days before I left Alaska Ed, Lisa, Andy, Trevor and I headed to McClaren summit, the highest elevation that you can access by vehicle in the entire state. Ed , Lisa and Andy were heading out on a 50 mile packraft and hiking trip for the weekend. I had to leave Fairbanks on Sunday and thus Trevor and I drove them to their drop-off point at McClaren summit. 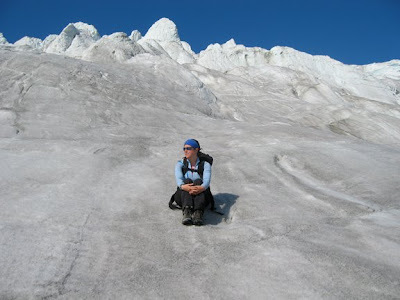 Then we hiked on Gulkana Glacier on our way back to Fairbanks. We left Fairbanks at the end of the day on Friday and stopped for pizza in Delta Junction I believe. There were lots of moose on the road and Andy and Lisa, driving separately almost hit one. Hunting season began that weekend so there were a few hunters toting rifles that we spotted along the road. As usual I was just in awe of the landscape and how much it changes with the light and time of day. 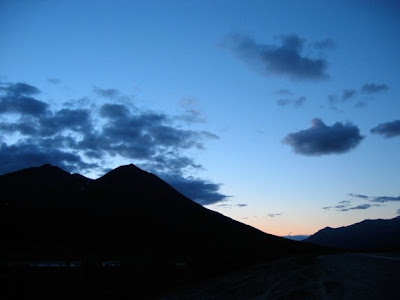 My circadian clock was all askew for my two weeks in Alaska as it tried to adjust to the sun being up at 5:30am and not setting until around midnight. Ed and Trevor taught me about the difference between buttes and tors and we debated what exactly a "traverse" entailed and if packrafting could be included within the context of a traverse. 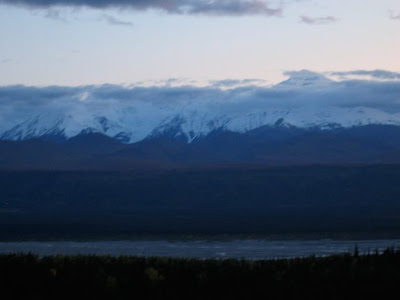 A part of the Alaska Range in the fading light. 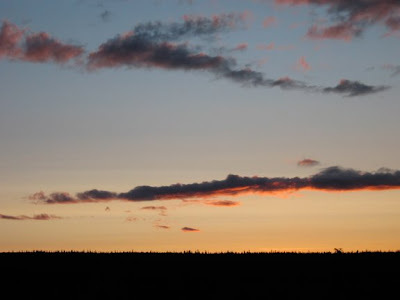 The abrupt contrast in light and dark with the sunsets in the north was beautiful. After dinner we headed for our camp, another 2 hours southwest of Fairbanks. The sun was down when we set up camp in the pitch black. It was quite disorienting as I had no idea what sort of landscape was around us...the most precious thing you can have when it gets that dark is your headlamp...it is invaluable. The next morning we packed up and Trevor and I headed off towards Gulkana Glacier for the day while Ed, Andy and Lisa began their traverse. I joked with Ed throughout my time in Alaska that his amazing trips through mountains and across the tundra every week were "Business As Usual" for him and his friends. I was swept up for a time in this world where packrafting and scaling mountains is as second nature as breathing and I was hooked on it all immediately. We set off and Trevor and I grabbed some coffee at a roadside diner on our way to the glacier. The bends in the road kept revealing even more glorious panoramas...it was like a postcard rack that you spin and each time it stops a new card is in front of you. I drank a lot of black coffee in Alaska...except when I was in Fairbanks where I could find some soy milk. Needless to say with some caffeine running through our veins we pushed off towards the glacier. On our way to Gulkana after dropping Ed, Lisa and Andy off for their traverse. As we drove along I looked around and could not believe the clarity, the sharpness of beauty in the smells, sights and sounds of everything around us. Plus, blaring and singing along to Coldplay made it even better. We arrived at the glacier around 10am and drove as far as we could along this road towards the glacier before leaving the car and continuing on foot. 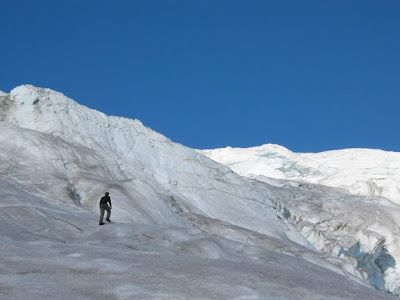 We only saw two other people on our hike, which took about 7 hours there and back with time spent on the glacier. 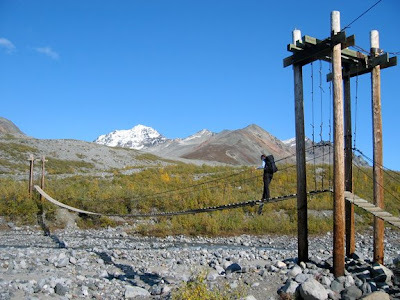 We came across a rather precarious bridge with wooden slats that crossed a small but swiftly moving glacial stream. It reminded me a little bit of the bridge in Indiana Jones And The Temple Of Doom, complete with missing wooden slats. 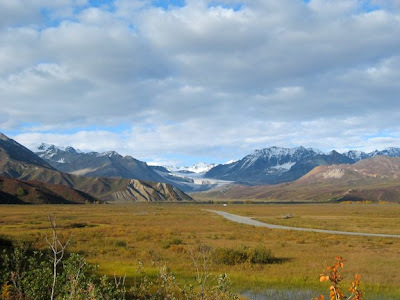 Gulkana Glacier is the most studied glacier in Alaska. There was a lot of monitoring equipment that we passed on our way up. 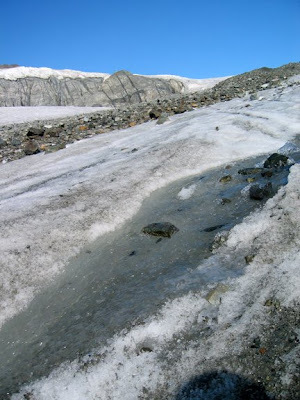 Trevor told me about the features of the glacier, the rocks it leaves in its wake as it recedes and all sorts of glacial terminology that I cannot recall. Needless to say it was very impressive to see a sea of boulders that we had to negotiate on our way up to where the ice began. 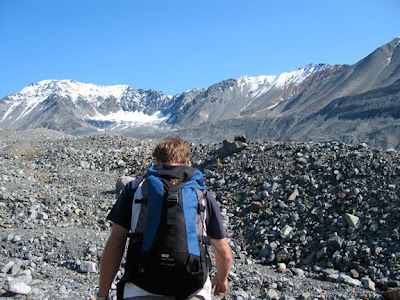 As we climbed Trevor informed me that we were indeed on ice but it was covered in silt and rocks but sure enough our footing became rather unstable periodically as we would step on ice that had a thin layer of soil on it, disguising how slippery it was. 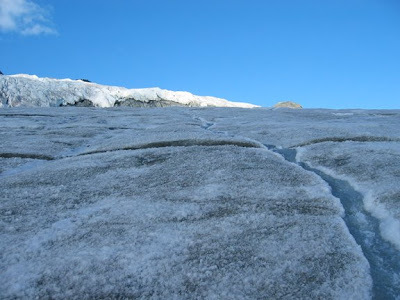 As we made it to the ice and started to climb the glacier proper the temperature fell about ten degrees. The ice was like tiny pebbles...almost gravelly. 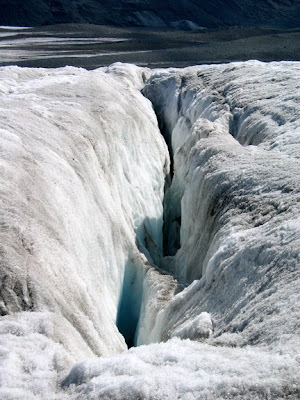 There were small crevasses with beautiful blue ice visible as you peered into them. 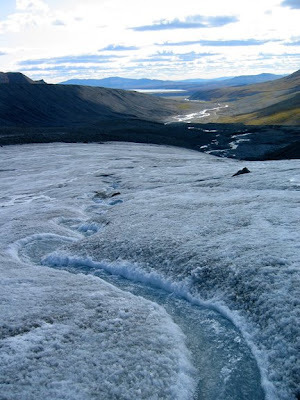 There were also lots of streams running past us too, clear little highways of water disappearing into crevasses or intimidating looking holes in the ice. We finally reached a good point to survey the view around us. Trevor continued up a little further after donning his crampons. It was a wonderful feeling being up there, feeling at once so large and so small, a part of something large and yet quite inconsequential at the same time...a very humbling experience. I wanted to freeze time and relish the place and space around me but we knew that it would take a good couple of hours to get back down so we began our descent after about an hour of meandering around and taking some photos. 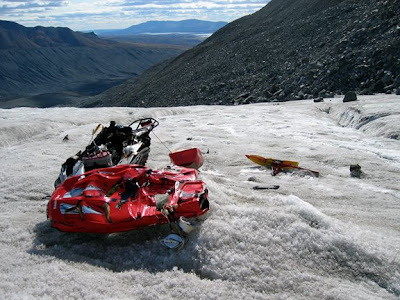 We came across this obliterated snowmobile on our way down the glacier. We didn't find anyone there so hopefully they were either unhurt from the crash or had been taken to receive treatment for their injuries. It was rather spooky to find this abandoned hull of a machine way up on the glacier though. Periodically we would hear large chunks of ice split and break off, sending crashes reverberating below our feet and in our ears. 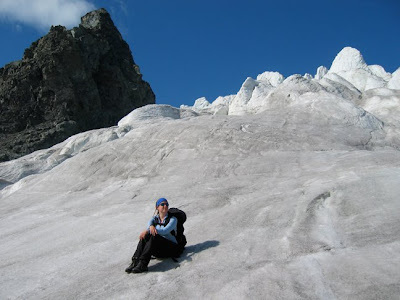 Here were some small crevasses that intimidated me nonetheless!! I loved the cool and warm tones that the sunlight cast upon the ice. This is my favorite shot from the whole day. It seems to take the entire world in...I wanted so badly to slide down the stream but who knows where I would have ended up? It took us almost three hours to get back to Trevor's trusty little Subaru. What an unreal day. I remember him asking me at the start of the day if I wanted to drive around the Interior looking at the mountains or climb a glacier? Needless to say it didn't take me long to decide! 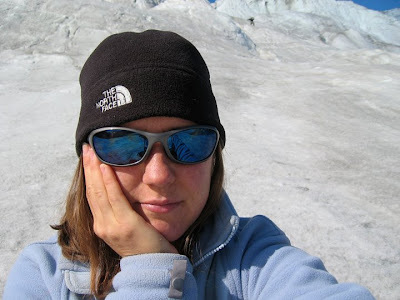 We didn't get to the top of the glacier that day but I felt as though I had reached the summit. I had never done anything like that before...and cannot wait to go again to see so much more of the endless possibilities that await in the North. Again, having someone as amazing as Trevor there made the experience even more invaluable. He is an easygoing guy and I'm pretty nervous sometimes so his laid back attitude helped me enjoy the experience without worrying about anything. Great friends are worth more than gold. That was my last day in Alaska before I flew back to Ontario. Now back in my studio I fought a good bout of melancholia after leaving the 49th state. But work must be done and I am back at the easel with renewed vigor now. Paintings are being produced and the energy behind them is fueled from these experiences in Alaska and Newfoundland the following month. 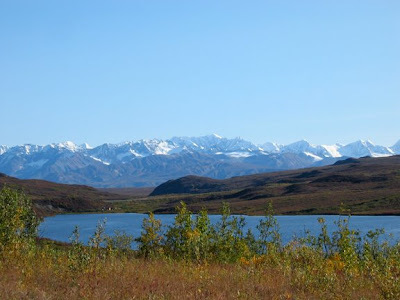 I intend to return as soon as I can to Alaska, to reunite with my good friends as much as any snow capped vista, to celebrate the best gifts of all: health, happiness and friends to share it all with. What more could one want in this life?